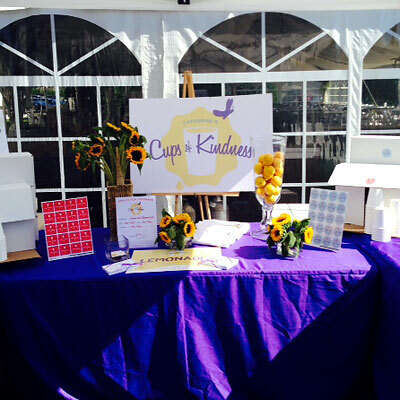 Catherine’s Cups of Kindness is an initiative that encourages people of all ages to raise money for the Catherine Violet Hubbard Animal Sanctuary by hosting a stand to serve drinks in return for a donation to the organization. The money raised from the Cups of Kindness stand is donated to the sanctuary and used to provide care for animals in need of support. At this time, while the team at Catherine Violet Hubbard Animal Sanctuary work hard to build the sanctuary and build it to the point of completion, fundraising and donations are needed more than ever. As part of our Make Nice Mission, we're helping you to add a little something extra to your Cups of Kindness stand. Once you've drawn the customers in with your refreshing cups of lemonade or warming sips of cocoa, offer them the chance to help Connecticut's endangered Red-Headed Woodpecker. Teach your neighbors about the endangered bird species: why they're so important, what's happening to them, and how we can help. Use our custom templates to create your own bird seed packets and sell them at your stand to raise more money for the cause. 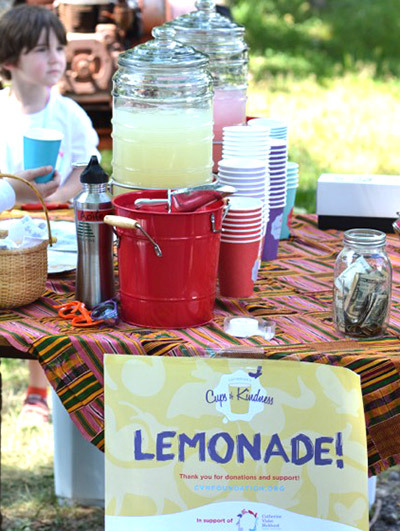 Take your stand to the next level by creating a crafting station and teaching people how to re-use their lemonade cups as the perfect bird feeders. 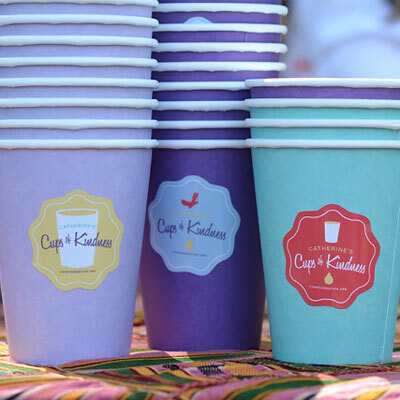 ORDER the official Catherine’s Cups of Kindness kit. Each kit comes with a box for donations, cups, stickers, temporary tattoos, two t-shirt iron-ons, a poster, event flyers, and a stack of informational postcards. To order your kit make a donation to the organization, sign up for the "Cups of Kindness" campaign, and wait for your kit to be delivered. CHOOSE a date to hold your stand and decide on the drink you will serve. Your drink of choice will likely depend on the season. Lemonade during the summer or a vegan hot cocoa in the winter. PROMOTE your event by making fliers and posters to hang in local businesses around town. Send an email to your friends and family asking them to stop by and to pass the word on. Briefly explain what your Cups of Kindness stand is for and why you are raising money for the Catherine Violet Hubbard Animal Sanctuary. Remember to let everyone know what types of things to expect at your stand: refreshing lemonade, warm cocoa, and crafts! SELL bird feed for the endangered red-headed woodpecker at your Cups of Kindness stand. The Catherine Violet Hubbard Animal Sanctuary is all about protecting and helping our animal friends. The red-headed woodpecker is just one of the species who can use our help. 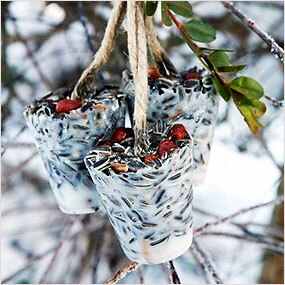 MAKE YOUR OWN BIRD SEED for the red-headed woodpecker. Be sure to include different types of nuts, seeds, berries and fruits. 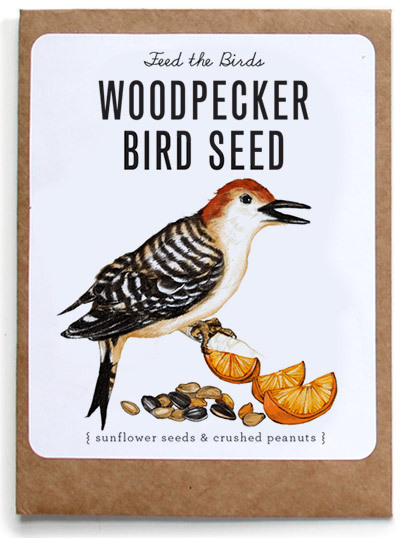 Sunflower seeds, crushed peanuts, apples, oranges and melon seeds are a woodpecker's favorite. Remember to cut the ingredients small enough for a bird to feed on. 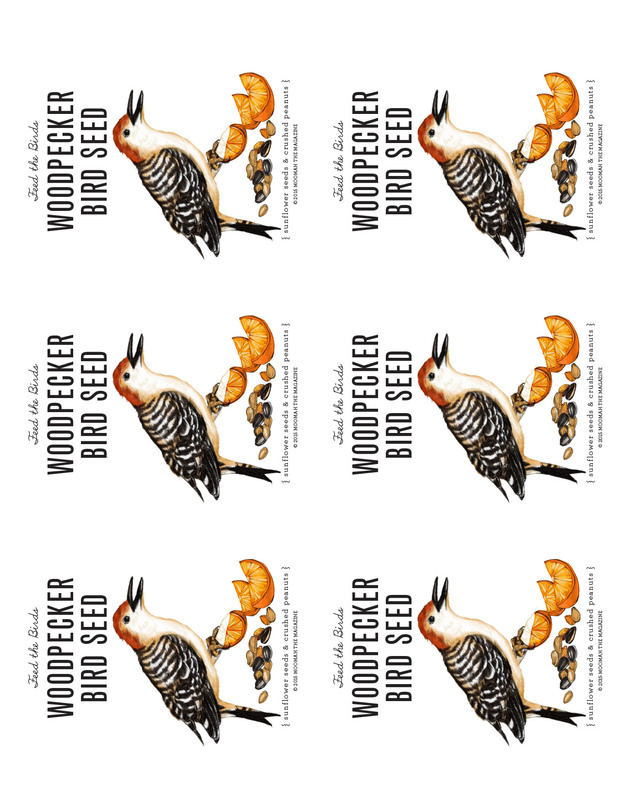 PRINT OUR BIRD SEED TEMPLATE onto Avery Shipping Labels and stick them onto envelopes. You can make six seed packets using one template. Decide on how many you would like to sell at your stand. PROVIDE INFORMATION ON THE RED-HEADED WOODPECKER for the people visiting your stand. Explain how the red-headed woodpecker has been on the endangered species list for many years and that it's important we do our part to help them in any way we can. Educating people about them is the first step. Making a small pamphlet or poster to keep at your stand may help to get the information across effectively. ENTERTAIN YOUR VISITORS by organizing a craft activity at your stand. Not only will you draw a bigger crowd by providing activities, but you will be teaching your visitors a little bit more about giving back to our animal friends with easy DIY crafts. 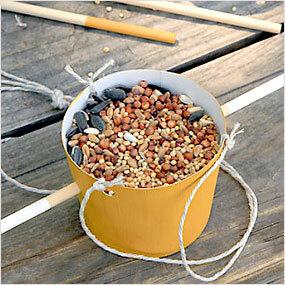 RECYCLE the used paper cups from your stand by turning them into bird feeders to hold the bird seed. 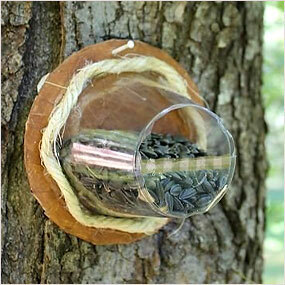 There are so many crafty ways to make bird feeders out of recycled materials. Below are three easy projects we found on Pinterest. Photographs taken from Pinterest. Click on the image for the original source. USE the kit box as your donation box and display your sign to let everyone know the stand is now open! Prepare your drinks and set up a table and chairs. PROVIDE water or dog treats for pets that might be out walking with their owners. HAVE FUN! Tell your customers to give what they can to help the Sanctuary. Let them know that everything is donation based. Remember to tell people about the cause and offer information about the Catherine Violet Hubbard Animal Sanctuary incase they want to host a stand or visit the sanctuary themselves. 100% of your contribution will support the sanctuary’s mission of enriching the lives of living creatures by promoting compassion and acceptance.